We have a variety of service styles taking place at Hillsborough Parish Church, reflecting both the diverse population and varying ages of all those who are seeking to find out more about Jesus, and the mixture of traditional and contemporary expressions of faith present in peoples’ lives. Should you have any queries please don’t hesitate to contact the Parish Office or chat to one of the Churchwardens. 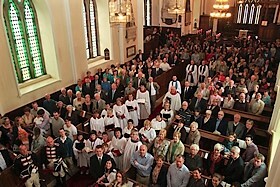 Our Worship service at 10.30am is based on the Church of Ireland’s Service of the Word liturgy. We hope to provide a space for reflection, to explore Scripture, and to worship God in a more contemporary style. There is a mixture of music both old and new, played by our praise band. There is a créche, Sunday School and a Youth Bible Study group, all of which take place during this service.